Posted on 21st March 2017 at 2:29 pm. The Education Village, Darlington, invited, sixth form providers, further education colleges, local businesses, training academies, support networks and armed forces recruitment officers, to its annual careers fayre which helps pupils make more informed decisions over their further education and career choices. It also staged workshop sessions ranging from Lego construction with engineers from Cummins to a graduate experience talk on student life from Newcastle University. The events provided the opportunity for pupils to access information on careers in the army, navy and royal marines, jobs in science, health care, construction, catering, hairdressing, beauty, animal welfare and engineering and also routes in A level education and degree courses in art and design. 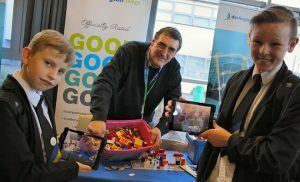 Students were given the opportunity to get their hands dirty constructing a brick wall, creating Lego animation films, taking pulse and heart rate readings using specialist health care equipment, making pancakes and enjoying an electronic massage. Year 7s and 8s heard from Newcastle University’s graduate ambassador Emma Flint about how to organise a student day including finances in a move to raise aspirations. Able and talented students formed teams to work with 10 Cummins engineers on a Lego engine project. Parents were also invited to attend the event which attracted local businesses including Hydram and Carillion as well as, Darlington College, Bishop Auckland College, Middlesbrough College, Queen Elizabeth Sixth Form College, Askham Bryan Agricultural College, Cleveland College of Art & Design, The Careers and Enterprise Network, Stockton Riverside College, Darlington Borough Council, The Royal Navy, The Royal Marines, BL Hairdressing, North East Raising Aspirations Partnership, The RAF, National Citizen Service, Morrison Trust, East Durham Houghall College and The Department for Work and Pensions.